Get a quick education on Ernest Hemingway with a visit to Oak Park, Illinois. Ernest Hemingway’s personal life was as interesting and adventurous as his fiction. So, while I was in Chicago recently I took a side trip to the lovely suburb of Oak Park, where I visited the Ernest Hemingway House and Museum. For Hemingway fans or if you enjoy books about Hemingway such as The Paris Wife, you’ll find a stroll in the author’s old neighborhood is delightful. In previous posts, such a the one about A Skeptic’s Guide to Writer’s Houses, I’ve discussed the fact that authors’ homes aren’t as interesting as the places where their books are set. Still, it’s fun to see how an author lived and maybe hear a few stories about family life that may have shaped his world view. For example, when you take the guided tour in the home, you’ll see the little dining room where Hemingway’s grandfather sat with the children for breakfast and encouraged all of them to tell stories. He didn’t long enough to see what sprang from such encouragement. 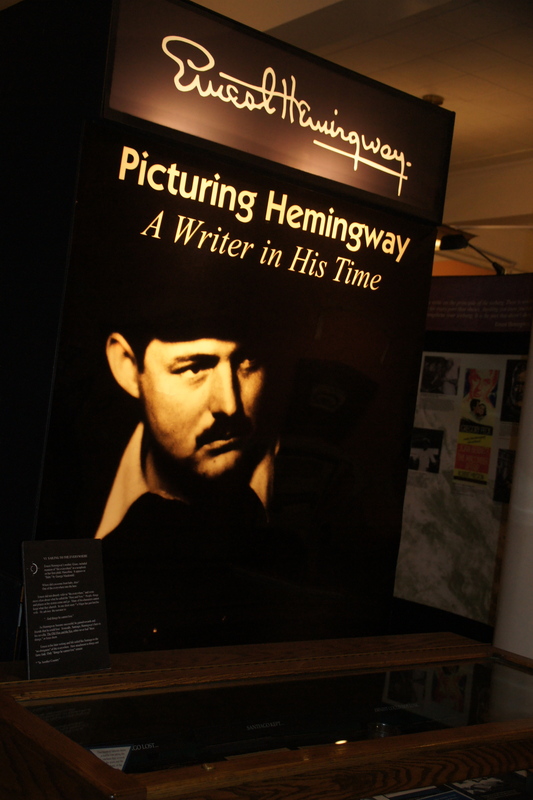 So, if you’re in Chicago, make a trip to Oak Park to visit the Hemingway family home. Start at the museum at 200 Oak Park Avenue 708-524-5383, www.ehfop.org The home where Hemingway was born is one block north. Wherever you go in Chicago, it’s important to keep looking up at the city’s fabulous architecture. 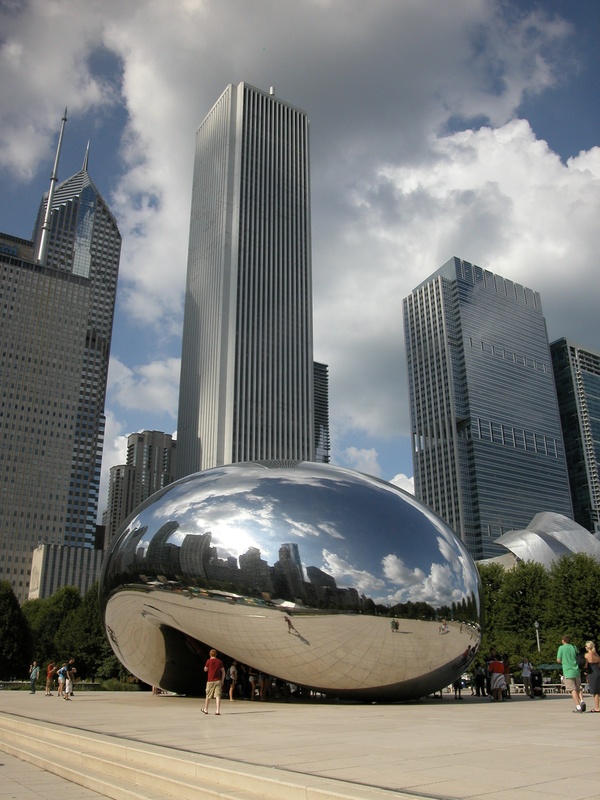 Above, one of the latest additions to Chicago’s skyline, Cloud Gate, a.k.a. The Bean. But you don’t have to be a connoisseur of skyscrapers to understand Chicago’s pivotal place in architectural history and the innovative, risk-taking outlook that continues to make Chicago “America’s City.” Two books have generated sky-high interest in Chicago by combining the stories of the city’s architectural lions with juicy plots. The first, Erik Larson’s The Devil in The White City: Murder, Magic, and Madness at the Fair That Changed America. The other book, Nancy Horan’s Loving Frank, a novel of historical fiction, tells the tale of architectural genius Frank Lloyd Wright’s scandalous relationship with his client, Mamah Borthwick Cheney. Each chapter in Off the Beaten Page includes an essay about a couple of books that create a theme or focus for your visit to that city, extensive reading lists, and three-day itineraries that offer ways to experience in person the books you’ve read and have fun in other ways, too. 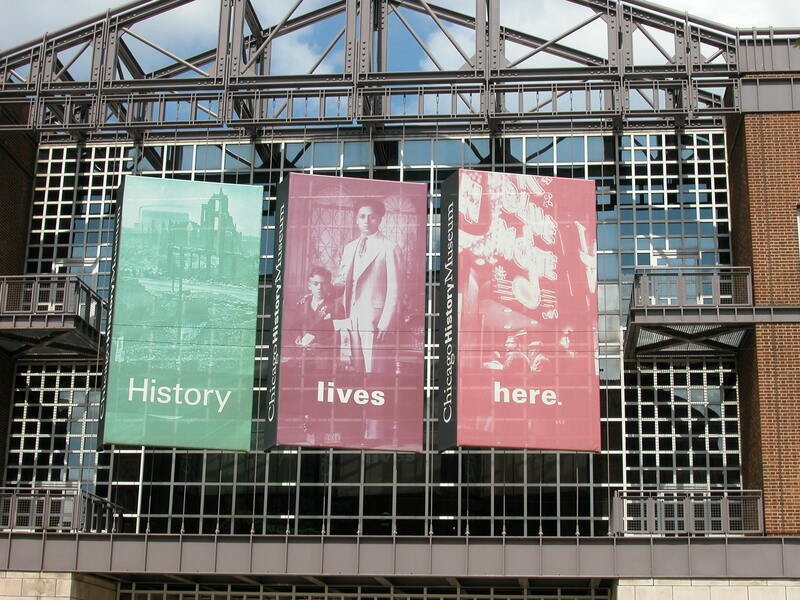 For example, the White City is long gone, but you can get a taste of what is was like by taking a tour with the Chicago Architecture Foundation. Wander Jackson Park, the site of the World’s Fair in The Devil in the White City, then tour Millennium Park, a modern-day bookend to the architectural innovation that began with that fair. Wherever you go, keep looking up. There’s been much gnashing of teeth and wringing of hands about the decline of reading, diminishing book sales, and the “death of print,” but there’s no doubt that books clubs are thriving. It’s hard to know precisely how many book clubs there are because they are often informal groups. However, according to Publishers Weekly there are an estimated seven million such groups in the U.S. and that number is rising. Art museums across the country are offering book clubs that combine literature with tours through their galleries. 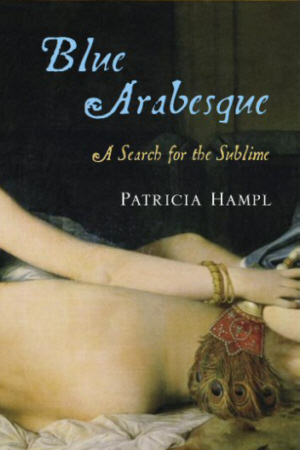 Blue Arabesque by Patricia Hampl is on the reading list at The Minneapolis Institute of Arts. Formats vary. Some art museum reading groups revolve around special exhibits or a featured work; others focus on art-related reading in general, be it fiction or non-fiction. Some require museum membership; others, such as the MIA, are open to anyone. All provide great reading ideas and opportunities for book club field trips. At the MIA, museum tour guides have been presenting book-related tours for four years, as requested by organized book clubs, but a newer program, which is open to anyone on a drop-in basis, has been running for three months. Men, women, young adults to seniors participate. Says Hegstrom, “The titles usually have something art-related but not necessarily. Guides can use artworks in the museum to explore themes presented in a book. Our goal is to include one fiction and one non-fiction title each quarter, with at least one of the books relating specifically to art or artists.” This summer they’re tackling The Savage Garden by Mark Mills, and Blue Arabesque by Patricia Hampl, a fantastic Minnesota writer. So, if you’re a local or a book lover on vacation, you’ll feel welcome at the MIA’s book tours which take place on first Tuesdays of every month at 11:30 a.m. and first Thursdays at 6:30 p.m. Also, for a list of what museums are reading and more information on the connection between art and literature, check out the Hol Art Books site. Last weekend I spent a really cold but delightful couple of hours wandering around Jackson Park in Chicago. I’ve wanted to go there ever since I read Erik Larson’s bestseller The Devil in the White City. Jackson Park is where the World’s Columbian Exposition of 1893 took place and that’s the subject of Larson’s non-fiction book. In The Devil in the White City, he weaves together the stories of Daniel H. Burnham, the legendary architect responsible for the fair’s construction (and later the Plan of Chicago) and H.H. Holmes, a serial killer masquerading as a charming doctor. He crafts the story so dramatically that readers often wonder if the book is a true story or a gripping work of fiction. I’m not the only one who has wanted to see where the story takes place. “When I finished The Devil in the White City I got in my car and drove to Jackson Park,” says Mary Jo Hoag, who is now tour director for the Chicago Architecture Foundation’s Devil in the White City tours. “I just wanted to see where it all took place.” So many readers have come in search of the White City that a host of tours have sprung up (given by CAF, the Chicago History Center, the Art Institute and other organizations) catering to readers who want to see first-hand where the plot thickened. Word has it that a movie version of The Devil in the White City is finally in the works, starring Leonardo DiCaprio as H.H. Holmes. That will create even more interest in seeing the real place where it all happened. The fair at night-- "like a sudden vision of heaven." 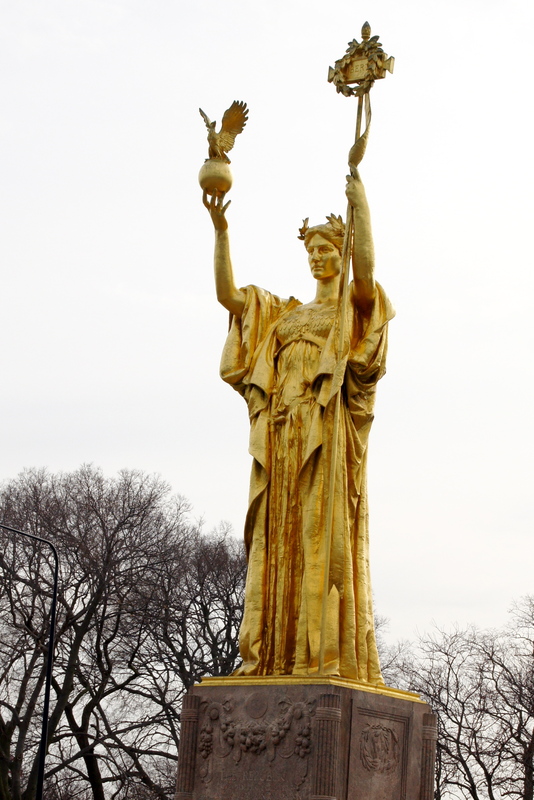 A one-third scale replica of Daniel Chester French's Republic, which stood in the great basin at the World's Columbian Exposition of 1893. It’s good that at least the Museum of Science and Industry survives (as the Palace of Fine Arts it held some of the world’s most valuable art and was built extra strong and fireproof) because it gives a frame of reference for what the other buildings at the fair looked like. That, along with Hoag’s collection of photographs and her great descriptions, helped kick start my imagination as we strolled through Jackson Park. Over here the Agriculture Building…over there the gigantic Manufacturers and Liberal Arts Building…a replica of the iconic statue of the fair, The Republic…. the Wooded Island where architect Frank Lloyd Wright took inspiration from the Japanese pavilion… Modern life creeps back in, though. Over there is the basketball court where Barack Obama used to shoot hoops with Michelle’s brother. Looking north down the lakefront from the Museum of Science and Industry, one has the sense that though the White City is gone, one of the best legacies of the fair endures: the idea that cities can be well planned and beautiful places. Jackson Park and Chicago’s long string of parks and open lakefront (part of Daniel Burnham’s Plan of Chicago) that make this city so special are examples of that great idea. Still, I look forward to seeing The Devil in the White City movie and how its special effects bring the White City back to life.